Clear, simple pricing for all features whatever the size of your wallet. Unlimited ViewsViews are subsets of your user-base. They are useful for projects in multiple languages ​​with global audiences and managed by teams in several countries. iOS, Android, WebsitesA single tool for all your platforms. Native push for iOS, Android applications. Web push for all mobile or desktop browsers that are service workers-enabled. Push DataPush data lets you refresh your app and update its parameters silently. Industry specific templatesSave time by using templates tailored for your industry. A / B TestingCreate multiple message variants and compare their performance. Fully customisable opt-in dialog for WebsitesYou have full control over the dialog content, look & feel. You also decide when to prompt your visitors. Predefined segmentsNew, 7-Day Active, Online, Dormants, etc. There are predefined segments for each stage of the user lifecycle. Event based targetingEvents are fired whenever a user performs certain actions of your choice, for example, “put item in cart”. 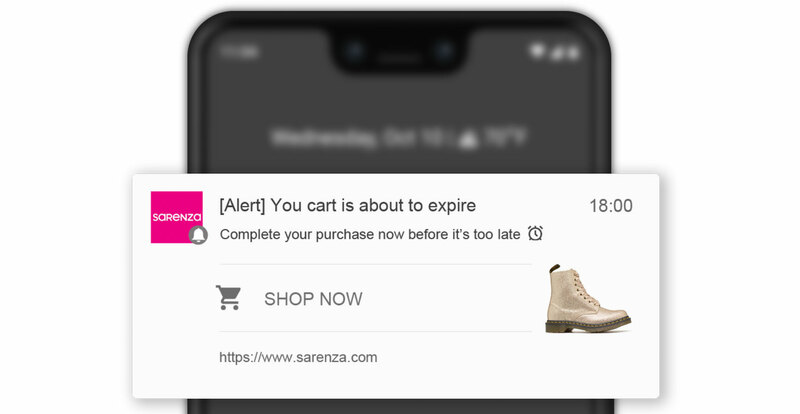 Event-based targeting lets you trigger automatic behaviour to follow up on these actions, for instance to create a cart reminder notification. TagsEasily tag users and use these tags to send relevant content to your users. Management APIOur Management API allows you to send notifications directly from your CMS or backend. Automated sendingSend notifications each time a user enters a segment of your choice. Full control of your user dataEuropean user data is stored in Europe. You decide what data is stored and for how long. By default, navigation data is kept for 3 months. We provide your users with ready-to-use tools for managing their privacy and data. Set a max monthly budget When you reach your limit, we’ll let you know and just stop signing up new users. Everything else continues unaffected. Monthly subscription billed 30 days after you sign upIf you sign up on the 15th January, you will be charged on the 15th of each month, starting Feb. 15th. Chat and emailAt the slightest problem, our engineers help you in real time via live chat. Our average first response time is less than 3 minutes. training, account management and more.